The goal of this article is to provide our visitors with step by step procedures to clean laminate flooring but specifically vinyl laminate floors. There has been a huge surge in the installation of laminate floors in residential homes but the commercial market is also using laminate flooring causing the need for an article on how to clean laminate flooring. The one thing commercial end-users must remember that laminate floor cleaning is simple and no magic is needed. Additionally we advise that when it comes to al maintenance or cleaning of floors including how to clean laminate flooring the commercial end-user should consult and review the warranty and technical support center of the laminate floor manufacturer to ensure that warranties are not voided. 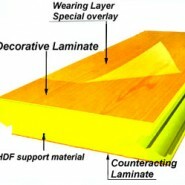 Typically most non-wood laminate floors are vinyl or some sort of composite vinyl material. Basically the commercial user can clean laminate flooring in the same manner as they would a vinyl composition tile (VCT). Dry Cleaning: The first step in any floor cleaning is dry cleaning which is removing loose debris from the floor such as dust, sand and grit. The most practical method for dry cleaning in a commercial building is dust mopping. A scraper blade preferably plastic is used to remove any soils attached to the floor. The best dust mopping results are delivered from using a microfiber flat dust mop tool. Dry cleaning should be completed at a minimum once per day in commercial buildings but if foot traffic and inclement weather is present, additional dust mopping will be necessary to keep the laminate floor clean and prevent damage to the laminate floor. Wet Cleaning: There are two wet floor cleaning methods that are used in commercial buildings. The first is manual wet or damp mopping and the other is using a cleaning machine such as an automatic scrubber. Manual damp mopping uses a mop and bucket to manually mop or scrub the floor. Be sure to sue a high quality professional grade floor cleaner that is safe for cleaning floors and ensure that it is mixed and used according to the label directions. Power equipment is another method of cleaning and is more practical than manual mopping larger floor areas. We recommend using an automatic scrubber equipped with a white or red floor pads (Least aggressive). Use a quality professional grade floor cleaning according to label directions. When using the automatic scrubber on laminate floors, use a single pass scrub method for daily cleaning. The single pass method means applying the cleaning solution, scrubbing and vacuuming up the solution in one single pass of the automatic scrubber.